It seems hard to believe, looking back, that it was only a little over a year ago when I brought out my first indie e-book. It’s been one of the best moves of my career. But I had no idea when I first started planning this around April 2011 that it was going to be at all successful. In fact, I’d been warned against it by industry professionals who made gloomy predictions that a) all the books would be immediately pirated, and b) that nobody would buy them anyway. But it was a decision born of frustration as much as anything else. Time and again I was told by potential readers that they always preferred to start reading a series from the very beginning. The early books in my Charlie Fox series had been out of print since my UK publisher was bought out by a larger house, and the US small press who’d contracted to produce them folded after the death of the publisher, while my mainstream US publisher considered the European-set early books “too British” to find an audience. In Killer Instinct: Charlie Fox book one the character starts out as a self-defence instructor with a murky past in the British Army that ended in disgrace. It’s in this book that Charlie turns a massive personal corner from being a former victim to someone who proves she can take care of herself. She gradually grows over the course of the first three books, meeting up again with one of the army instructors who played a part in her downfall and going undercover into a close-protection training school in Germany. Her first proper job as a bodyguard happens in First Drop: Charlie Fox book four, and that was where my first US publisher chose to pick up her story. Back in April last year, I decided that everyone who wanted to would be able to catch up with Charlie’s past and find out how it all began. When you write a series like Charlie Fox, where the characters develop as they go on, any missing episodes are keenly felt. Having the first five novels largely unavailable was a huge gap in the character’s backstory, and―understandably―readers were put off giving the later books a try because of it. E-books allowed me to bridge that gap. I was able not only to make the early books available again, but to give them a recognizable series look they’d never had before. And just as an introduction to the character herself, I put together four existing short stories that featured Charlie into an e-thology, adding a brand new tale to the mix, an excerpt from Killer Instinct, a character sketch and author biog, and calling the result Fox Five: a Charlie Fox short story collection. And the result? I was amazed that the books started selling almost immediately and have continued to do so at a rate that far exceeded anyone’s expectations, least of all my own. For the first time I know exactly how things are going, all the time. And it’s been both a liberating and inspiring experience. Twelve months on, I’m now bringing out my first digital original novel, Die Easy: Charlie Fox book ten. Yes, it’s part of the existing series, but it has not previously been conventionally published. My current US publisher, Pegasus, went to contract before the book was even written, so they’ll be bringing it out in the States and Canada in January, but the rest of the world is down to me. 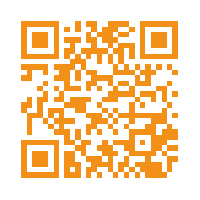 Kindle first, then trade paperback and other e-formats to follow. So, why is the backlist doing so well―better, in fact, than it ever did via the conventional publishing route? The truth is, I don’t know. 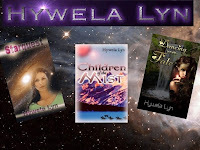 I’ve tried to include enough extras to appeal to my readers, including excerpts from the next book in order, and guest excerpts from other mystery and thriller authors I admire. I always felt the books were good, and the character engaging. The reviews and award nominations seemed to echo that, and Lee Child was generous enough to write a Foreword for Killer Instinct. Maybe the difficulty of obtaining the early books was the major stumbling block. Distribution is one of the bugbears of a great many authors. Bookstores and supermarkets can’t stock everything, and they tend to go with the same safe familiar names. If you’re not in that clique, you’re not going to get the exposure you’d like. But digital books are available all day every day, everywhere. Maybe that’s enough to tip the balance. Whatever, it’s given my writing career a huge boost. I’ve been able to completely retire from the day-job to write full time. It’s enabled me to work on other projects, too, including a standalone crime thriller which will be out before the end of the year. Suddenly, being able to publish more than one book every twelve months has made me realise that there’s nothing to stop me writing more. And I can explore other genres. The latest project has been a supernatural thriller. The next will be a trilogy with a new character, possibly a new series. But that’s not to say I’m going to abandon my roots. Charlie Fox is where it all started for me, and for as long as she has a journey, I’ll tag along for the ride. Zoë Sharp opted out of mainstream education at the age of twelve and wrote her first novel when she was fifteen. She created her no-nonsense ex-Special Forces trainee turned bodyguard, Charlotte ‘Charlie’ Fox, after receiving death-threat letters as a photojournalist. 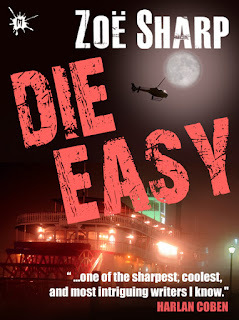 Her work has been nominated for the Edgar, Anthony, Barry, Benjamin Franklin, and Macavity Awards in the United States, as well as a CWA Dagger, has been turned into a short film and optioned for TV. She blogs regularly on her own website, www.ZoeSharp.com, and on the acclaimed group blog, www.Murderati.com. Yesterday was a very important day for me. My wife and I celebrated our one year anniversary yesterday. Anniversaries are typically a day where you celebrate fidelity, staying together, and renew your vow to stay together in the future. When it comes to writing, however, I have not been that faithful to my genre. Sometimes writers like to write the same type of book over and over – always YA books, always non-fiction, or always thrillers. There is some logic behind it since it is easier to develop the fifth like-styled book than it is the first because you have experience with it. But for me, I have found that I have so many different stories to tell that I cannot stay within one genre. 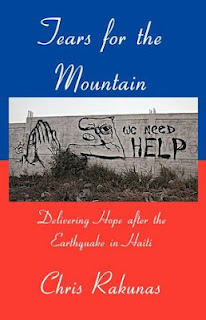 My first book, Tears for the Mountain, is a non-fiction about a medical mission trip to Haiti following the deadly earthquake there. 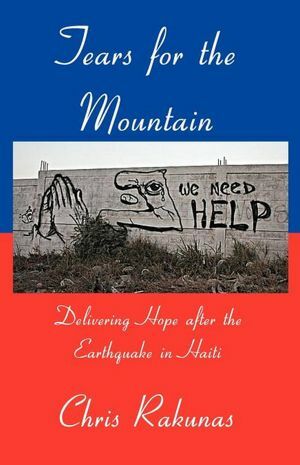 The story follows the delivery of 20,000 pounds of medical supplies to hospitals damaged in the earthquake, and along the way the team faces gangs of roving bandits, heartbreaking stories of survival, and even deals with a notorious Haitian warlord It has been the subject of a CBS news report, which was very helpful since a portion of the proceeds from the book go to the orphanage in Port-au-Prince where the team worked. Writing the book was a great enjoyment for me, and at the book signings I’ve done in Los Angeles, New Orleans, and out in Florida, I have really enjoyed speaking with readers about it. But when it came time to write my second book, I did not have another non-fiction story that grabbed me in the same way. Tears for the Mountain was such an intensely powerful story that I did not want to write another non-fiction unless I could find an equally compelling topic. Instead, I found myself months later standing at the base of the Temple of the 7 Dolls in Dzibilchaltun, Mexico, and a fast-paced action story was running through my mind. It is a Mayan temple, so we were all discussing the 2012 end–of-the-world prophecy that some people believe in, and I couldn’t stop thinking about it for the rest of our trip. The idea seemed like a great one to me, tying together elements of Mayan architecture and culture to weave a story about murder, love, and redemption that had the plausibility of a non-fiction, but was completely fictional. I felt a little guilty at first, wanting to write a story that was so different from my first book. Would my readers be happy with the switch, or would I be losing my audience? Did they want to see more non-fiction, or would this be interesting for them? What I realized is that you have to be faithful to yourself when it comes to writing. If there is a story you want to tell, then you need to tell it, regardless of what other people think. If your passion starts out to be writing about vampires but then you want to write about cooking, there is nothing wrong with making that switch. The fans that you have, the audience you bring with you is interested in both your stories and the way that you tell them. When you want to write, the purpose is not to stick with the same plot lines, or tell the same stories over and over that you’ve already heard. The purpose is to tell something new and fresh and exciting, a story that readers want to read. If the best way to accomplish that is to switch things up, then so much the better. In life, it’s ok to try new things: new foods, visiting new places, playing new games. I find that writing in new styles brings the same sense of excitement and vigor. So while last night was a day to celebrate something that has remained constant in my life, writing does not have to be. 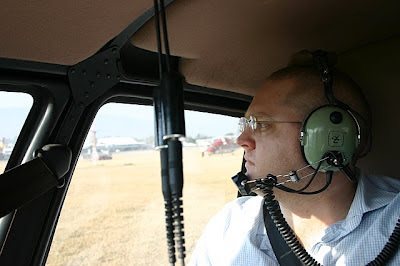 Chris Rakunas is the author of two books, Tears for the Mountain and The 8th Doll. Both are available in Kindle and Nook, as well as in paperback. You can follow him here on Facebook to get updates about his upcoming book, The Eye of Siam. Autumn - time of mellow fruitfulness etc. Well, it was officially the end of British summertime at the weekend. What summertime? I hear you ask. Good question, it was a bit damp and miserable for the most part wasn't it? And the promised 'Indian Summer'failed to materialise. However, in a couple of days it will be Halloween, so I thought I'd share some ghost stories. 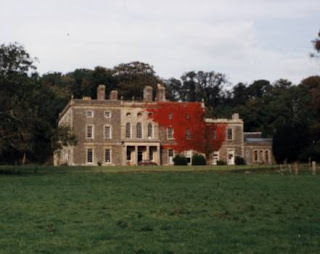 One of my favourite places in all the world is Nanteos Mansion, near where I used to live, in Wales. I used to keep my horses at the stables and spent many a happy hour soaking up the atmosphere of this historic house, built in 1738. The Mansion has its share of ghosts and an interesting history. 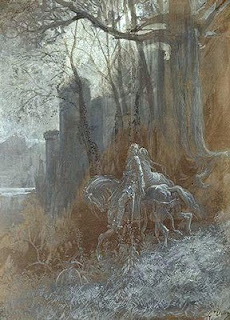 Late at night the stables would ring with unearthly screeches, like souls in torment. Actually it was nothing more sinister than a colony of screech owls nesting nearby. (Or so I was told.) 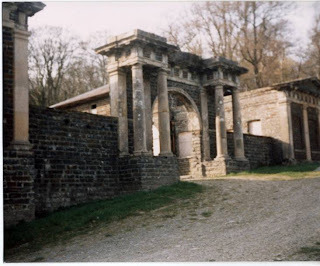 The owner of the stables, which, when I was there, had been sold as a separate entity from the Mansion itself, swore he’d heard ghostly hooves galloping past, late at night. Many legends name Nanteos as the one-time resting place of the Holy Grail, the chalice that Jesus and his disciples are believed to have drunk from at the Last Supper. The cup, known as ‘the Nanteos Cup’ was apparently brought back from the Middle East in AD 63 by Joseph of Arimathea, who settled at Glastonbury Monastery in the west of England. When the monastery was dissolved in 1539, a number of monks fled with the Holy Grail to Strata Florida Abbey, in the Aberystwyth area, and from there to Nanteos, where the cup passed into the hands of the Powell family. The Grail was famous for its supposed healing powers, and water poured from it was highly sought after as a cure for various diseases. I’ve actually seen the ‘grail’, or what was left of it The owner of the house (and the cup) a Major Merrilees, eventually moved to Herefordshire, taking the Nanteos Cup with him. It is understood that it currently resides in a bank vault somewhere. It is a small wooden vessel (5″ diameter, 3″ deep) in a very poor state today, due to pilgrims biting large chunks out of it, over the years, in order to aid recovery from their ills. There, there are still ghosts to be found in the many rooms of the mansion. One of the ghosts said to haunt the old house is the spirit of Elizabeth Powell, the late wife of William Powell, who wanders the hallways looking for her lost jewellery. The story goes that her husband William Powell dearly loved her and showered her with jewels. She could not bear to be parted from her treasured jewellery and at the end of her life, dreaded to think what would happen to them after her death. 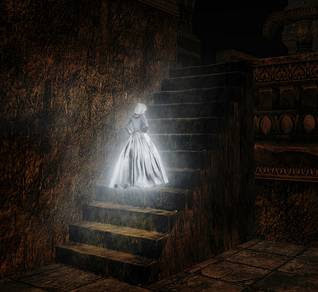 She rose from her death-bed and gave the jewels to a maid, to hide.Later that night she passed fiom this life Today her ghost, shrouded in a long flowing gown, still wanders like a lost soul searching for her hidden jewels. It is said she will haunt anyone that dares look for her treasure. Parties were often held at Nanteos. One evening the house was full of guests, an army officer present went to dress for dinner. Climbing the stairs to his room he met a striking woman in evening dress, holding a strange looking candle stick. Thinking she was one of the guests he bowed and bade her good evening. The lady did not answer but carried on down the stairs as if she had not seen him. He thought it strange but continued up to his room. On returning to the party he gazed around looking for the lady. Eventually he asked if anyone has seen this woman. Immediately, he was taken to one side and told never to speak of the lady with the candle stick or there would be a death in the family. That night, the Lord of Nanteos died... and the strange candle the lady had carried was found a week later in a dusty shelf in a corner of the Silver Vault Room. A phantom horse and carriage is also said to pull up to the front entrance in the middle of the as a forewarning of a death. The most eerie sighting was from the front door, and was that of what was thought to be smoke in the inner hall. The witness stared in disbelief as the smoke transformed in a figure dressed in a long flowing dress. She began coming towards the front door, terrifying the onlooker so much that he ran to Aberystwyth, not daring to look back. Horses and voices were heard in the stable yard at Nanteos on two consecutive nights at about 4.00am, but as soon as the listener peered into the yard the noise abruptly stopped. My favourite story is a rather sad one. One of the windows on the bottom storey were boarded up for many, many years. The story goes that the lady of the house was watching her husband ride up the drive towards her, when the horse spooked and threw him, killing him instantly. She could not bear to look out of that window again and ordered it to be boarded over - and so it remained until the mansion was sold a few years ago and completely renovated.. She mourned for him the rest of her life and they say his ghost still rides up the drive at night. I like to think she rides with him now. 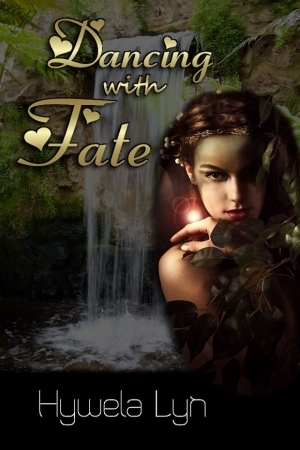 I thought I'd end with an excerpt from my novella 'Dancing With Fate', which is actually quite a light fantasy tale, but it has its dark moments, like this one, which features the 'Ellylldan' nasty little goblin like creatures of Welsh folklore. The glowing red sparks appeared a few hours before dawn. Terpsichore looked across to where she could just make out Myrddin, lying close to the fire, apparently asleep. She stood and wrapped her brat around her shoulders. What unearthly lights were these? In the name of Hades, she had never seen anything like this before. She watched them as they advanced and retreated, advanced and retreated. They seemed to beckon to her. She walked forward a few steps. This was not natural. She sensed evil, but of a kind she had never come across before. She tried to turn her head, to look away and move back to the fire. Some force compelled her to keep staring at them, to move forward. Further and further from the campfire she wandered. The air grew chill and she pulled her brat more closely around her. The flickering lights gyrated in a wild dance, inviting her to follow them. Dawn was approaching. In the dim early morning light, she could make out demon faces, red glowing eyes, hands outstretched, with flames at their fingertips. She recoiled in horror. Somewhere in her subconscious, she knew she was in deadly danger, but still she moved forward. They summoned her to follow and she could not help but obey. She tried to call to Apollo, and her father, but her mind was numb. She could reach no one on Olympus. “Myrddin!” No sound came from her lips. Still, a strange unearthly power obliged her to walk forward toward those eerie, mesmerizing points of light. The ground grew soft beneath her feet. Cold mud oozed between her bare toes. The further she walked, the deeper the mud became; eventually, she realized she was up to her waist in chill, muddy water, and she was powerless to turn back, or even to move any more. For the first time in her eternal life, she knew fear. These creatures of nameless evil had her trapped. They would drag her down to the underworld and she would never see Olympus or her family again. October 28th - my birthday, innit?